How can you pray if you don’t believe that God is listening and that you are important to Him? Understanding how important you are to God is a foundation of spiritual connection as well as spiritual growth. Ani L’dodi, V’dodi Li means “I am for my Beloved and my Beloved is for me.” The verse is an acronym for Elul, the month in which we are now preparing for Rosh Hashana and Yom Kippur. Getting in touch with our love for God and developing the faith that we are God’s beloved is an essential part of Elul. As we prepare for Rosh Hashana and Yom Kippur, it’s not too late maximize the power of your prayers and overcome any obstacles. Read more about about obstacles to prayer at Breslov.org. Shana Tova Umetuka and Kesiva Vchasima Tova, May you be blessed with a Good and Sweet New Year and Written and Inscribed for Good. 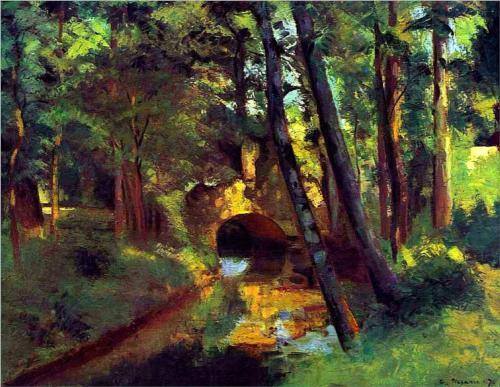 Image: The Little Bridge, Camille Pissaro. Hello and a happy and healthy new year! Thank you for this informative web site! And a big thank you about prayer. I do believe that God does hear me, I’m the deaf one.